Are you still manually testing your emergency lighting? Switch to paperless digital compliance for your buildings and estates. Save time, money and free up resources. Track compliance digitally with our smart sensors and automated reporting platform. Automated Emergency Lighting testing without anty technician visits. Real-time testing & compliance reports sent wirelessly to the cloud. A platform with secure reporting, compliance and audit history. Our platform shows status for every single device, in every single building in your estate. Up to the minute. Switch to completely reactive testing, compliance and repair by assigning works to your team immediately. Cut annual visits by 90%. Improve your compliance regime and save time, money and resources. We are delighted to work with our partners and customers below. Relying on manual inspection and paper reports is now high-risk behaviour. 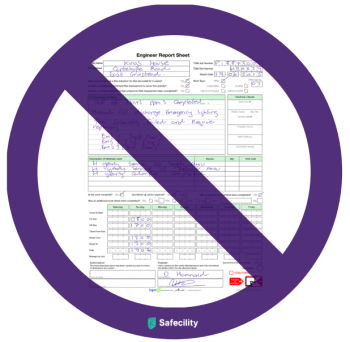 Are your technicians still visiting site and completing paper emergency lighting reports? It’s time to stop. We can help you. Automated your testing using our sensor or mobile app. Safecility Lite mobile helps you upload paper tests or complete digital forms. Collate all your compliance records for emergency lighting across entire estates in one place. Our sensors are compatible with major brands so you can avoid vendor lock-in and roll out at your own pace. Our colour-coded alerts show you errors upfront. Attend to failure first. You can quickly assign repair work to your team members within the platform and track progress. purposes only. Please do not use them in commercial projects. Safecility is a product of The Convex Lens. Copyright © 2018. safecility.com. All right reserved.